I met with José Oubrerie in February at the Standard Hotel in downtown Los Angeles, and later we drove to the Schindler House on Kings Road. He was in town for the book launch of Et in Suburbia Ego: José Oubrerie’s Miller House edited by Todd Gannon. The following is our conversation. Orhan Ayyüce: What do you think about recent state of architecture education? OA: Mark Wigley is very good. JO: He doesn't like architecture. JO: You can have a really good professor and make you discover things. What I like about American school compared to France or China that this kind of connection between the best people in architecture and the school. 'Best' I say in certain way, you know. And because not everybody has the same opinion about architecture. I think the other thing is, that most of our students are very good when they get out of school and then they have to deal with professionals and they get hit. It's very difficult for students to find work where it can be a development for them, the same time supporting architecture. The job they do is even bigger problem because 95% what Americans build is not architecture. Nothing historic, they are big but they are not architecture. OA: It is a market thing. How do you define architecture? OA: What do you do? JO: Not to make a building to just make a building, but start making a contribution to architecture. And you consider that you are not a star architect... If you want to make quick connections or meet big people to get jobs and play golf, you act commercially, and, what makes you get jobs is showing an example of what you did, you have to do something else. OA: Do you feel like that part of the character you describe, you couldn't do it yourself and maybe that's why you did very few projects? JO: It's a part of some architects, it depends, I mean, it's a question of networking. My late work is of only architecture... I am not included in the circles of the American society, I'm not a business man, I never was. OA: Frank Gehry is a very good business man? JO: He became a very good one. He is wanted by what he is doing. Working for Corbusier was not that easy. When I started to work with him, I had not so much architectural education and it took me three years to really understand what we were doing.OA: I think he's a very good architect. Though, more of an analog guy. Kind of a happy sculpturalist. But I've never been in a Gehry space that wasn't good. I think popular media only knows him via his late work, the ones he shows to potential clients who want that kind of Gehry. JO: He's trying out the formula. I like him, I have a met him several times. Getting back to one building, remember Pierre Chareau - Maison de Verre Some has one project that was very good and that was enough. OA: That's what I was going to bring up, the architects with few buildings. Ludwig Wittgenstein did one house for his sister but what a house that was, better than Adolf Loos. But he was a philosopher. I guess that’s what you mean, you look at these architectures, you look at Miller house and you see, feel and you learn something about architecture. John Hejduk with few buildings is another one who is very good. Peter Eisenman too, the early houses. JO: I think Peter is great too. He's the one who accomplished a big step in architecture. OA: Remember, Philip Johnson with his five architects? Richard Meier, Michael Graves, Peter Eisenman, Charles Gwathmey, and John Hejduk. JO: And apart from Hejduk, the only one who did something was Peter. Peter with the Wexler Center because he subverted the modern discourse, invented and developed a new aspect of specialty, involving the issue of modern architecture and reinterpreting in his way. Richard Meier, on the other hand is much more successful commercially. He makes combinatorial Corbusian dilemmas. OA: You worked for Corbusier, what is to be learned from Corbu himself? JO: That's difficult question to answer. OA: (laughter) Do you feel like whatever you learned from Corbusier you took further, and maybe you did with Miller house? How do you feel about this question? JO: For me, I have two projects that have been important to me for my development. The building I did in Syria, the French Cultural Center and the Miller House. Cultural Center was a very close interrogation of Villa la Roche. And the other was the Miller House, which we worked with the language in which we were working. When I start to build and after I did these two projects, I kept my education and what I understood from Corbusier alive. What I experienced with these two projects was very important to me. Also the Firminy Church was finished in 2003 and I said “Oh my god, I was seventeen when I started the church.” So, at this moment I was happy my church was finished so I could do other things. OA: How did you get the job from Corbusier? JO: I told him that I can do the work. It's very difficult for students to find work where it can be a development for them, the same time supporting architecture.OA: Corbusier designed a master plan for Izmir, Turkey and later he went to Chandigarh. JO: He was ready to experiment things. You have to redefine the program, the program of the house, to me that had to be redefined. That was the first stage. If I was doing another house I would even redefine it in a more interesting way. OA: I saw something here on the site… Another house, it's awful. How do you feel about this? JO: What can you do? OA: Usually homes have front and back, but Miller House doesn't have a front or back. Evan Chakroff wrote very well about the elevations of this house. JO: Yes indeed. It's a recollection of the front facade. You enter everywhere. OA: It’s an occurring problem with houses. It needs to be all four sides. What do we learn from these houses? All the students are extremely fascinated about the details. OA: Do you have any prospect of getting any new projects? Does your telephone ring? 95% what Americans build is not architecture. Nothing historic, they are big but they are not architecture.JO: I have no idea. My telephone doesn’t ring... Even when I finished the church I was thinking maybe someone will call me… nothing... I don't know. I do competitions. I start to make competitions because they are always interesting. JO: Anything... Any scale. I don’t believe in big city plans, working with big developers. I don't know. OA: A single building is always a start. That's why the houses are important. You can get corrupted by the big developers. JO: Yes. Not only monetarily but design-wise as well. OA: Not to change the subject but Oscar Niemeyer designed a house in LA. OA: A Los Angeles house, it's beautiful, it's in Santa Monica. JO: I want to see the Schindler house. OA: I can take you there if you like. JO: Where do you live? OA: Thank you Mr. Oubrerie. Have you seen Wilshire Boulevard? This is a re-print of the actual article published in Archinect. See the link below for the original article with reader commentary here. Let's make this thing launched right! Be there or be axonometric. We have concluded our first four weeks project before the Spring Break. grounds and infrastructure. No other requirements. Chicano Batman and Buddy Zapata will be performing. This was a stellar show of meaningful rich content developed for the scenario. Congratulations to all the student and thank you to the guest critics, Rob Berry, Aram Guiragozian and our own Alexis Navarro. Something - something happened and I end up having to write him a little e-mail note on a personal matter, he responded five minutes later, I wrote him back ten minutes later, asking if he is interested in me interviewing him. Ten minutes later he wrote me back that he has read something I wrote and he liked it. In thirty minutes, the coffee hour was scheduled for two months later at Starbucks across his office in Santa Monica, where we are both kind of locals. If you have anything to resolve or get it done with Thom Mayne, be prepared to do it right there and right then. Now, I am not a total stranger, as a SCI Arc student I know Thom from the late seventies when he was starting out both as a teacher and as a practicing architect honing his work. In addition, we shared the same industrial three-unit corrugated metal building for a couple of years. Morphosis = leasers, my ex wife and I = sub leasers. Theirs: 24/7 office, ours: 24/7 live-in studio space. Stoner Avenue in West Los Angeles, circa; 1985-86. That was a pretty close vantage point to a firm which became synonymous with highest recognizable credentials of this artful profession. Since we were in the front division of the building, a lot of the young and talented Morphosis crew / friends used to stop by our "house" first and had wine and beer with us on a regular basis. After that, I mostly lost track with them, everybody went their own ways and after those formative years of Morphosis, one band became many good bands, led by those people on Stoner Ave. office. Their central projects at the time were Kate Mantilini Restaurant with postmodern style grid markers layered over the facade, structural beams running wild, puncturing the stucco and steel sculptural sundial inside the space that never was as a sundial. And, there was Hennessey + Ingall's Bookstore which they were working on or just completed. If you study some of the most recent Morphosis projects, you will see the seeds in that early work I have just sampled. I would go into their office middle of the night and chit-chat with my friends who were working on those projects, hand drafting the signature exploded axonometric drawings, building cardboard design models, producing working drawings and all the while making the transition to more of a deconstructivist phase of the firm. During those years, Morphosis quickly raised in the ranks, only second to Frank O. Gehry amongst the soul freeing Los Angeles school, if it could be called that. Their moving on the trajectory was partly due to its principals' energetic dispositions and appetite for architecture. It was also partly due to their academic positions in SCI-Arc, which allowed them to draft and retain a talented and experimental practice that survived on relatively small projects and fees. The office was active all the time and it was not unusual to be visited by Tadao Ando, Peter Cook, Rem Koolhaas, Zaha Hadid and others. Not to mention close colleagues like Eric Owen Moss and Gehry, even though I personally did not encounter most of them, except Ando and Cook. As it was arranged, I went to their office to get him and walk across the street to Starbucks and talk. This was not going to be an architectural theory discussion but just a light, conversing type of an interview in my mind. I did not want to ask him lofty questions about how he designs. As far as I am concerned, that is between himself and his soul, his co-designers and their clients. Plus, there are many pages of material about that stuff written by critics, journalists, students and fellow architects. I was loosely interested in how he manifests himself as a person, and hopefully to get an idea of what he is like nowadays. Through eye contact, I wanted to see if I could crack open the "bad boy/angst retaining master architect code" that is attributed to him. I was also curious about what would happen between the prize-winning architect and me during an elongated coffee break. Also, I was going to try to get him to say, he likes "my project" (later, on that one). Morphosis operates out of an approx. 2000 sq. ft. open office in which he has his own desk space behind the administrative area. If you enter the office, and if Thom is there working his hours, he would be the second person you see after Carla, who choreographs his minute-by-minute moves around the globe. Enter Morphosis, turn right, and say hi to Thom Mayne, the Pritzker Prize winning architect. When I arrived at 9 am, he was in the main space, talking with 3-4 architects, obviously about a collective design decision or something. By just superficially hearing it, I would say it was a democratic conversation. It seems like, he receives just as many directives as he gives out, from his lean but highly trusted team of architects-my take. Half of the architects who would work there seemed to be absent, perhaps traveling around the world, running hi-level projects and conducting presentations. Do not be fooled by relative calm at the modest Morphosis Headquarters. Just look at their current projects and the sheer size of their impact, both as buildings and as architectural benchmarks. Several minutes after my arrival we walked out of the office. I was taping, and the sounds were mixed by traffic noise, some lost. - "Great... We just got a nice hotel suite in Paris." - "There is nothing like a nice hotel suite in Paris..."
- "What about New York? Do you go there often?" - "Wow, great cities to visit and build. But you are still here in Santa Monica?" That, he is glad to have his sons not becoming architects (one is studying pre-medicine, the other interested in philosophy). I tell him, how good it is for him to have a doctor son, especially with raising health insurance costs, and he concurs with the tone of someone who doesn't completely feel financially secure. I order regular coffee and he orders nonfat latte. I insist and pay for them. I am glad to do so. I remember he is being a cool person to lease a studio from. Cashier asks his name and his coffee cup has "Tom" written on it. OA- How do you feel like at the age of 63, getting all this high visibility large projects? TM- It is weird that they just start to give you those projects around the age of 60-65 which you could have done around the age of 40-45. OA- That was the age you were when we lived next to you around '85-'86 and I think you were just about to go to teach at Harvard around that time. Michele Saee, Eric Kahn, Martin Mervel, Brendan MacFarlane, and, Kiyokazu Arai who used to work for Morphosis at that time. Those guys were my friends,. I distinctly remember Kazu. TM- Oh yeah Kazu... He was like the silent partner. He worked with us almost ten years. I learned a lot from him. He was a ferocious designer. He worked so fast, it was hard for us to keep up with him. He set up difficult standards to follow for everybody else in the office. He was a pure design facility, fast and highly talented. OA- Kazu and I took the architectural license exams together and we both failed every one of them back in those days. OA- What is he (Kazu) doing now, do you know? I was his first friend at SCI Arc. He was very shy. His main problem was he could not speak English very well. He could have cared less about that. I often wondered about what goes through his mind, he always looked at you as if his mind were somewhere else. TM- Yeah, he is the head of an architecture school in Osaka of which I am a board member. Most people who worked for Morphosis ended up teaching somewhere. Small perk, let's just say. OA- I know you have been to Turkey a few times, what do you think of Istanbul? TM- First I was there 6-7 years ago lecturing and I was back there last year again for the Pritzker ceremonies. It is just an incredible city. So haptic and sensual, you can touch it, as it is so visual with its hills and old buildings, minarets, domes... And, of course Hagia Sophia, it is more than a building, it is a landscape. And, the cisterns beneath. Ahhh, such a history. OA- I agree. Turkey is a very sought after piece of land in terms of value. If one looks at it in terms of real estate, it is a prime real estate. TM- Anyway, getting back to Istanbul, it is a phenomenal city, and of course it bridges Europe and Asia. The Bosporus itself is very amazing situation. OA- It is an important city to build a landmark building. I wish your Phare Tower (or better), was there. Istanbul needs to break into architectural jet-set in terms of hi visibility. It needs an important current architectural piece to jump start the tradition, a newer paradigm. TM- Yes... Who wouldn't want to build a pioneering building in Istanbul? We go back to regional problems, Iraq, asymmetrical warfare, etc...I realize Thom Mayne loves talking about international politics and he is well informed on the subject. And, he is opinionated about most of the things he talks about. I am too, but we do not have that much time today. He tells me; "Things are much more different these days. Things are rapidly changing. You have to realize, wars have changed, conflicts have changed, it is like the language, constantly changing. You have to be able to move...You have to move quickly to new situations, it requires agility." TM- Absolutely...Look at the generation before me, Kappe, Koenig, Gregory Ain and all those guys, look at 20 th. century, look at Corbusier, Kahn, Mies, Aalto and of course, *Corbu being the most clever (* he sneaks in that bit, a personal favorite obviously), it wasn't that long ago when architects developed that language and the rest worked on it most of their lives. Like they developed something and they spend all their lives producing some kind of variation on it. Some people can still do it, like Meier, I guess. However, as a production model that is no longer enough or valid. OA- Thom, I want to thank you for creating a challenge for me to find more about your work, therefore running into lots of information and some interesting stuff. I've read and watched several interviews you gave, a few talks, such as; Pritzker, Charlie Rose, TED and Princeton lectures. I visited your web site, even checked out a couple of books by Christian de Duve, whom, you have mentioned to Charlie Rose, that you were fascinated with. To be honest with you, I am not a Thom Mayne scholar, I did not know all that much about the work other than I was around locally to see your beginnings, development and recent Caltrans building in downtown Los Angeles. In a few weeks, I have seen many questions which one could possibly ask you in an intelligent way and I saw your answers to them. I have learned all these things since we made a date a couple months ago. Now, I want to ask you, what are "you" learning these days? TM- (smiles) Actually, I have shifted all my academic work at UCLA to urban projects. It has definitely had a profound effect on my thinking. This is what is taking place in larger context right now, globally, it is urbanistic work. I did three different urban projects in LA recently. We are doing a new project in Madrid, Spain, large urban project and a social housing project. I got a sense that they were using us in a wrong way. They had a very conventional idea, a priory, not specific to the area and they were using architects to design singular buildings. The problem is not a single building problem it is an urban problem. So, I went back to them and said "I want to take my students there and study the problem and give you alternative ways of looking at the issues," really broad alternatives, not only physical but strategic alternatives in broad terms. We have just finished that last week, and it is published and it is going to biennale in China and I am presenting it to the people in Madrid in October. That work is really starting to shift everything we are doing. Everything I am doing is involving around that macro to larger concept. I am starting to look at buildings more strategically. I started to do that more with Eugene Court House. It is not the best building we have done but it did make us to look at things more from that strategic point of view. For me, it is a different way of thinking. We are also doing this project, a high school in Corona, California in which I shifted the issue to energy. It is in desert, and we are going to do a zero carbon footprint building with complete solar power. The desert is the harshest environment to try to do that. And, guess what? The peak energy consumption is during the summer when the school is closed... I'll tell you soon, how many houses we will supply energy to during those months... We are talking with the state to work with us. The governor, whom I spoke last week is interested. He says the energy is his main issue and I am asking him, â€œare you interested in a prototype you can brag about?â€ In short, we are learning to look at bigger issues, methods and strategies. Designing the single buildings are not the biggest issue. Of course we are going to design them (buildings), when they come in to the office, we are architects after all. I am starting the projects with broader ideas where we can focus on prototypes and set new standards. I am going back to my earlier urban design interests, to the cities, where the two thirds of the world population are going to live in the near future. I hold a cup in my class and say we are going to redesign this, and most students immediately start to work with the shape, but smaller group will ask questions like; how many of these cups are needed every year? How many times is each cup used? How many cubic yards they will take in the garbage dump after they are tossed out? How quickly they will decompose? That is where I am moving into right now. I am more into that smaller group where they ask these questions, which is also my nature. I always ask questions. We all start as formal designers, we start asking questions, as to who we are as architects, but the questions are changing as our office culture is changing. Again, architecture is nothing more than how you articulate questions and questions you choose to address. Because you cannot address all the questions, it is really, about which ones you choose to address. People think of architecture as form and language, but it is not that at all. The ones are asking formal questions are doing architecture just at that level and they are not asking other questions, right? OA- Yeah, it is somewhat limited at that level. TM- Sure. So, the way I am learning and the way our office culture is changing, because our questions are changing. You ask a question to Thom Mayne and you might get a three-page answer. What you have just read is an uninterrupted answer to my single question. Obviously, he is in constant motion. Asking questions about every project in which he is involved, interacting with answers, asking more questions and setting everything around him in continuous development, including his close circle of collaborators. OA- You know, there is a lot of chatter these days about startreks, pardon me, about starchitects. The profession is getting tired of all this discriminating ranking system. People are disenchanted with it. What do you say? TM- They should be disenchanted with it. It is ridiculous. I have nothing to do with it. OA- Okay, then, say something bad about it. You are a bad boy, right? (big laugh). TM- I have nothing to do with it. I don't like it. C'mon, you realize in the public realm, you have a limited control of what is said about you because you don't control your own media. They write whatever they want to write. Hey, the magazines have their own trajectory system and their own marketing bla bla. They need continual renewal and it seems like in American system, they rely on personalities rather than the work. I am really the unlikely suspect. I am kind of a shy person, kind of private person, and I like to say what I want to say. I am not that diplomatic. OA- Likewise... I remember you coming into SCI-Arc student meetings and after students throwing profanities at you, leaving the meeting in disgust. TM- Yeah. (Laughs). You know, I forgot his name.., umm, Inaba of Volume Magazine, he asked me to write something about "ambition." First I said yes, than I thought about it and said to myself, "I don't want to write about this. " I get many questions like, "how can I become famous? " And I go, "oh dear, you don't have to worry about it, it won't happen. Do your work." OA- Thatâ€™s right, a lot of people forget the most important part; the work. Most people think fame is the only means to success. Actors have huge problems with this fame issue. It is not pleasurable. It is hell. Hang out with somebody like Brad Pitt or somebody who is really famous, they are very restricted in public. They could not do what we are doing now, there would be two hundred people here already asking autographs and stuff. OA- Speaking of Brad Pitt, what is he like with his interest in architecture and all that? OA- If he were asking you for a job, would you hire him in your office? OA- Yeah... Well, it is not my business. I am not that much interested in him, other than he is interested in architecture. OA- Do you know who Alain Robert is? TM- No. Who is he? OA- Alain Robert, also known as Spiderman. He climbs hi-rise buildings around the world. He climbed La Grande Arche in Paris, next to your future Phare Tower. TM- Yes, yes I remember him. OA- I bet you, he will try to climb Phare. Can he climb your building, given the curtain wall system you people are designing for it? TM- Oh, absolutely. We got 3-D surface he will love it. OA- If there are some problems, please do some design changes. Be nice to him. He is kind of my hero...Thanks in advance. OA- When is the Phare Tower is going to be finished? I really like that project. TM- Construction starts next June. You know what the strange thing is? It is the first project we have done that everybody loves. Most of our other projects, people either love or hate them, but this one, everybody seems to love it. OA- Well, to me, it is like a person that you can put your arm around and walk away. OA- You asked me earlier about what I am doing with my work. I am designing this small house in Argentina for David Lamelas, the conceptual artist. It is near Buenos Aires. It is a summer home for David, who lives most of his year away from Argentina. Do you think you can give me a quick crit for it, while I have you here? TM- Good job. Nice project. We both laugh and I push the stop button on the tape recorder. I take three pictures of him and the interview is over. I give him a book by Orhan Pamuk called ISTANBUL: Memories and the City (I gave the same book to Michael Rotondi too, his ex partner, when I have interviewed him last February). He asks me to sign it. We walk back to his office, talking about me and my background. I thank him for his time, and exit to parking lot. From my car, I realize how developed the surrounding section of Santa Monica has become, complete with overbuilt corporate entertainment industry buildings donning cast stone ogee mouldings and subsequent traffic jams, making it difficult to turn left on Broadway Avenue but not entirely impossible for the willing. Link to original article with comments and dynamic links. As Tafline Laylin writes in Green Prophet, More than 40 million people worldwide have been displaced from their homes and left to find shelter in strange lands. Maybe they find a tarp, or a tent, but their quality of life almost always remains dismal. To close this gap in need, Jordanian-Canadian architect and designer Abeer Seikaly designed a new kind of shelter. One that allows refugees to rebuild their lives with dignity. “This lightweight, mobile, structural fabric could potentially close the gap between need and desire as people metaphorically weave their lives back together, physically weaving their built environment into a place both new and familiar, transient and rooted, private and connected." Teddy Cruz was a Pavilion by himself at the Shenzhen Biennale and talk to you about that project as a preview. Perhaps yo heard it first. Architecture without Drawings? Possible but with a life's commitment. I am in my second semester as the newly hired full time instructor. With that, I get to teach new classes and new subjects. Some inherited/interpreted material and some new content. Above picture is Noel Sanchez interpretation and process drawings of Hand Gestures project you are all familiar with. Noel is studying "Agreement, Retention and Hesitant expressions of his two hands. Those are difficult drawings. Well thought out flawless strokes of the pen creating spatially distinct compositions and utilizing different line weights. Poetry of the architectural drawing is clearly visible. In Arc 170, basic architectural drawings, lettering, and understanding of 2 and 3 dimensional drawings and visualizations. Today I collected enough shapes to manage a chaotic city. And of course, the rock stars of the program (you shall all get there eventually); 202 advance studio students on a site visit to Mariachi Plaza where we will be designing a Mariachi Center, providing health services, recording rooms, instrument repair shop, visiting scholar guest rooms, community room, music rooms for teaching Mariachi music, a coffee shop and other amenities to make the Mariachi's life easier and more prolific. The cover of the book we have produced in two days and about to come out in a week. Working session has started., Eight fearless gunslingers from Los Angeles, Fresno and Berlin talking about Downtown, Rodney King Riots, apartments, art scene, people of LA, immigration, consumerism, global cities, ports, board games, Archinect, tourism, biennales and catching a carp in LA River and eating it in a taco, playing Buddy Zapata's Turo album in every brake and leaving Shenzhen upon completion of this installment of LAB A/U kind of like Veni Vidi Vici. In next two years world's first nomadic biennale will be hosted by many other Biennales. Wall projection behind the work table. Sazrah is talking about her project. Paperback collectibles I hauled to China. Paul is interviewing Ole in the radio station booth. Work table from where I sit. Work is done I am on top of Hong Kong Peak leaning on a Foo Dog. The Yin and the Yang! I am sleepless and I can't get used to the idea that I am in Shenzhen, China. I might as well be in Las Vegas hotel room with a gold leaf framed watercolor print hanging on the wall and a laptop with a spotty internet access. This is my first time in China with a mission to attend and journal the opening of Bi-City Biennale of Urbanism\Architecture a.k.a Shenzhen Biennale in a four day trip as the lone participant from Los Angeles. Normally I don't travel in the jet set manner but I was flown here by an invitation from the biennale's creative director Ole Bouman, a man of many talents and hats whom I interviewed for Archinect few years back and I couldn't refuse the offer. 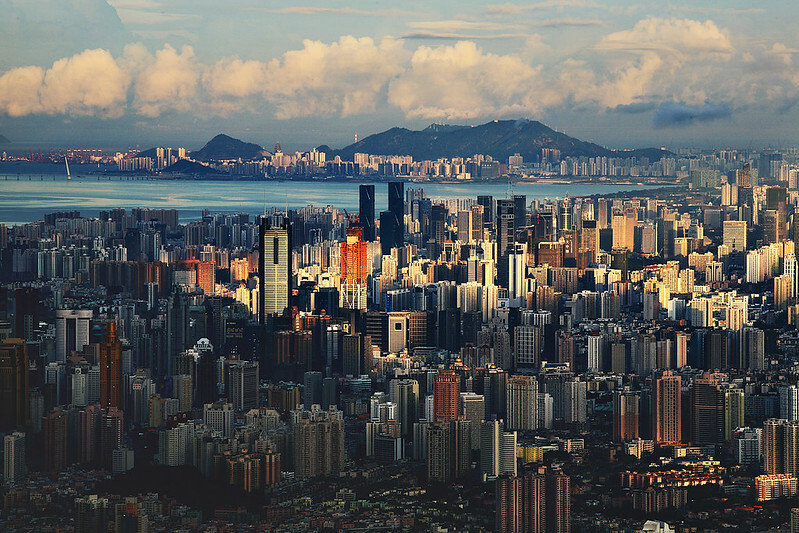 Shenzhen is a port city, like my birthplace Izmir and it has graduated to its current importance as a global player from a small fishing village of 30,000 people just a few decades ago. It is a brand new home to 3.5 million Shenzeners who are made up from different nationalities, trading partners and Chinese working population trying to join middle class, still chancy but not at all impossible given the local and national growth rate. It is an incredible development for a city coming of an age in such a short time. The pains of urbanization in this rapid pace are somewhat apparent but I would say the city is dealing with them rather skillfully. Since Shenzhen is new, so are my shoes, socks, pants and shirts. Biennale's main venue in Shenzhen is a defunct plate glass factory in the urban border zone called Shekou. It is the center of the Biennale's ambitions to turn it into a cultural zone of preservation and perhaps leave it as the living history of the industrial past with a newly energized use, co-existing with the vicinity's inevitable gentrification into a high end residential development, an omnipresent transformation pattern in the world's developing cities as it's towering chimney looking over one of the most familiar sceneries of global trade, a shipping container port and other supporting warehouses, not too far away from a creeping shopping mall, a 7-Eleven, a Sea World© and a Wal Mart. The Glass factory now named as the Value Factory is an irresistibly beautiful industrial building where glass was manufactured to be used on China's modern buildings as recent as 2005. It is next to a bank of silo towers also defunct and turned into exhibition spaces. Biennale, capturing the opportune process is determined to turn it into a cultural value and educational centerpiece all at once. The Value Factory is unlike China's brand new shiny museums of late, designed by missionary architects from the Western Europe and United States and hastily filled up with blue chip art through the deals made in New York, London, etc. This is an interesting difference not only from a preservation and re-use point of view but also helping to build a unique Chinese experience in the "biennale" making to further activate local discourse of cultural value making, a veiled agenda and political act in itself.